winter Archives - Oh My Dog! This past weekend brought the first *real* snow of the winter. Sure, it’s been painfully cold on and off for weeks, but we really haven’t had much snow at all. I’m certainly not complaining! Some Indiana winters stretch from October to March, so I’m pretty happy that we’ve only had the one big weekend of snow. Of course, Cooper and Emmett aren’t fans. 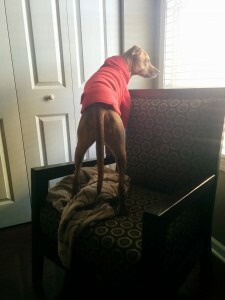 Even in his coats, Cooper doesn’t want to stay out for longer than it takes to do his business. 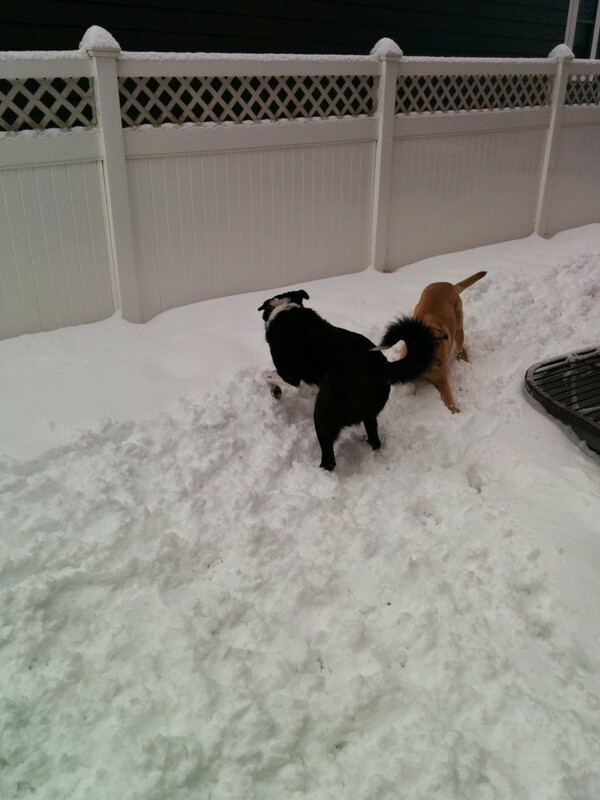 Lucas, though, loves snow. Loves, loves, LOVES snow. He could stay out and play all day, but when he doesn’t have anyone to play with, he sort of pouts. 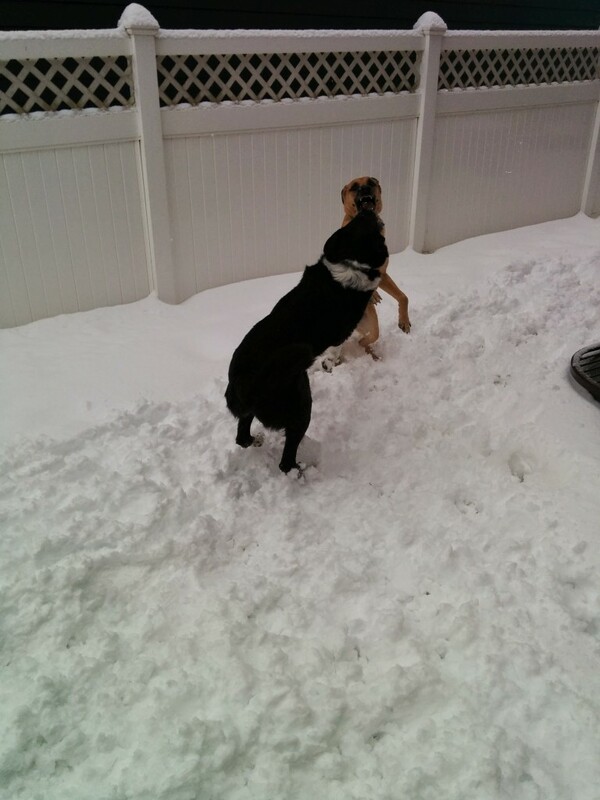 Luckily, his best friend in the whole world, Cady, loves snow just as much as he does! And, thankfully, she had some free time in her schedule to come over for a play date. 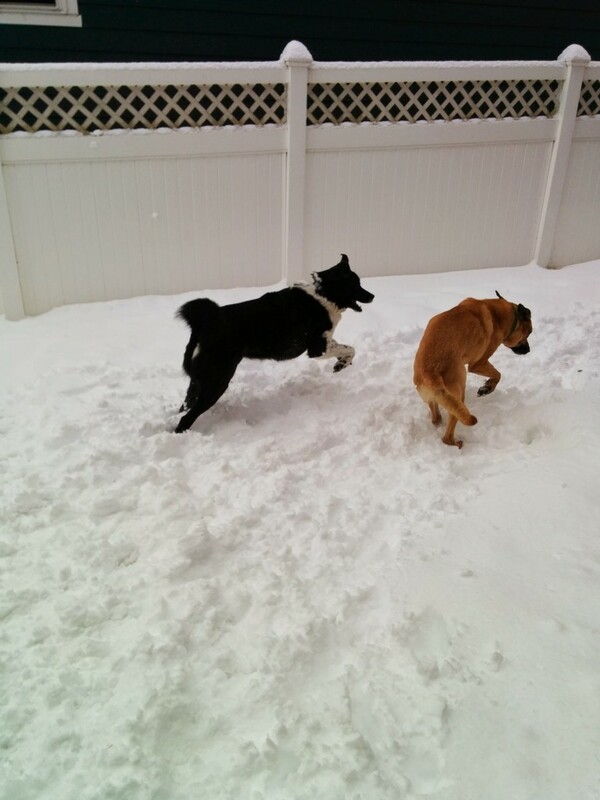 It is VERY difficult to capture the fun on my phone when they’re running and pummeling, but here are a few snaps plus a short video of their joy! I tried for a video, too. Here’s a 20-second glimpse of what they did for a about an hour! 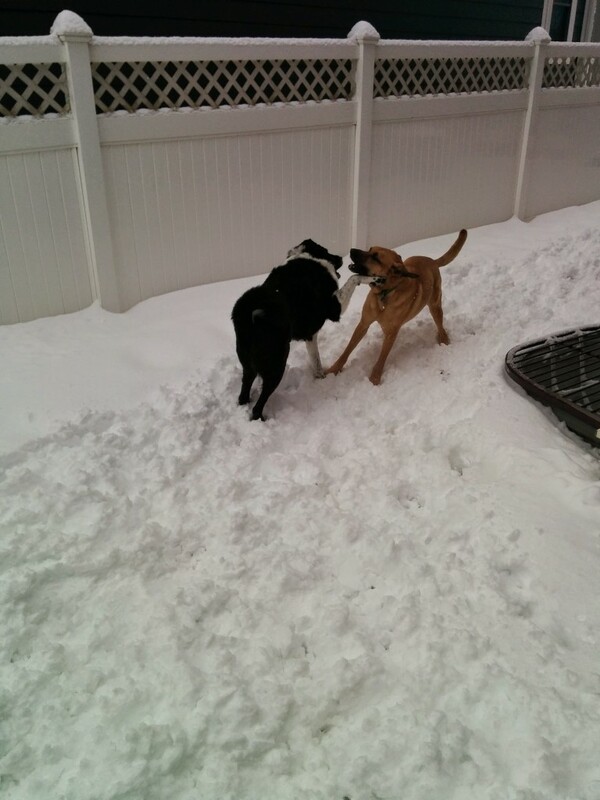 Snow day play! from Maggie Marton on Vimeo. They sure had a blast!! Over the years I had forgotten about that conversation until recently. Now, I realize, that this applies to our aging dogs. 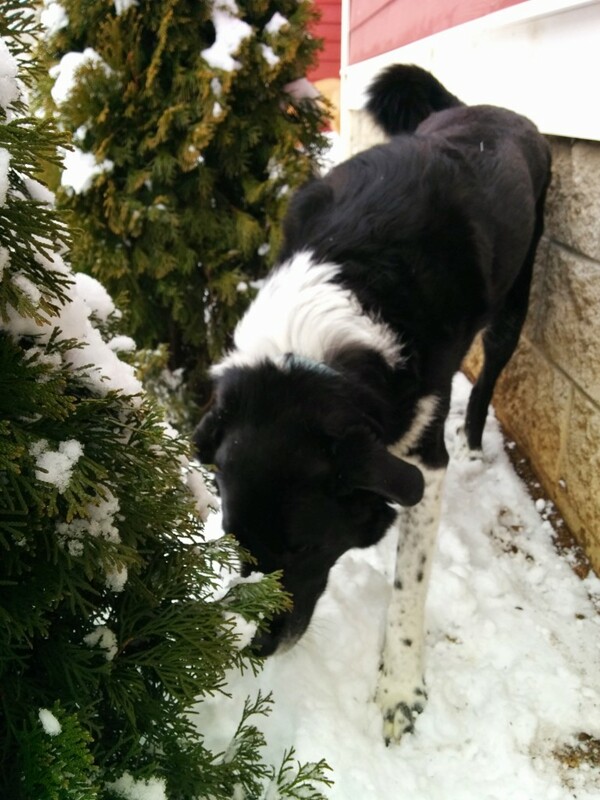 Emmett used to love the winter. 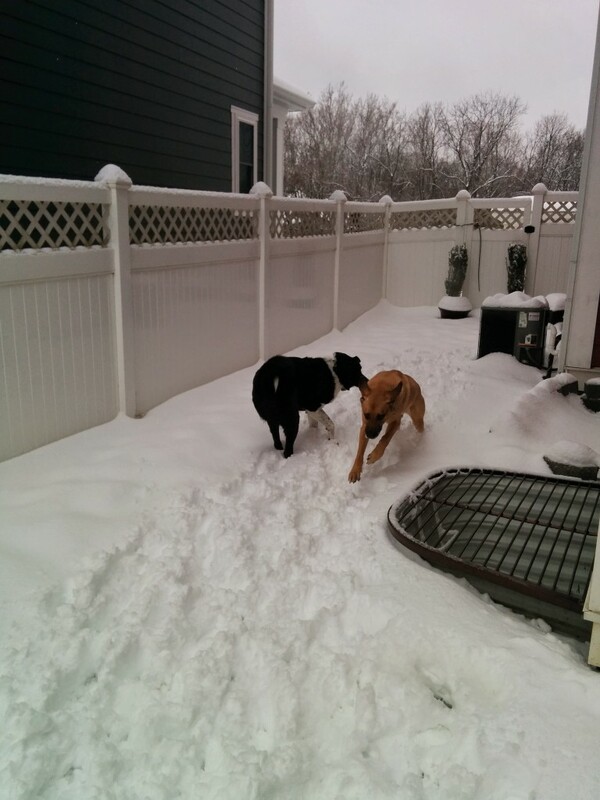 This was long before Cooper, but he and Lucas would romp in the snow, tackle each other, and chase a bright red rubber ball through the drifts in our backyard. After an outdoor play session, they would curl up in front of the fireplace together and bake themselves warm. At some point in the last couple years, that’s changed for Emmett. Now, he runs outside, does his business, and runs back in as fast as possible. Plus, as his joints have gotten stiffer over the years, I imagine his body feels the cold a lot more forcefully than it has in the past. 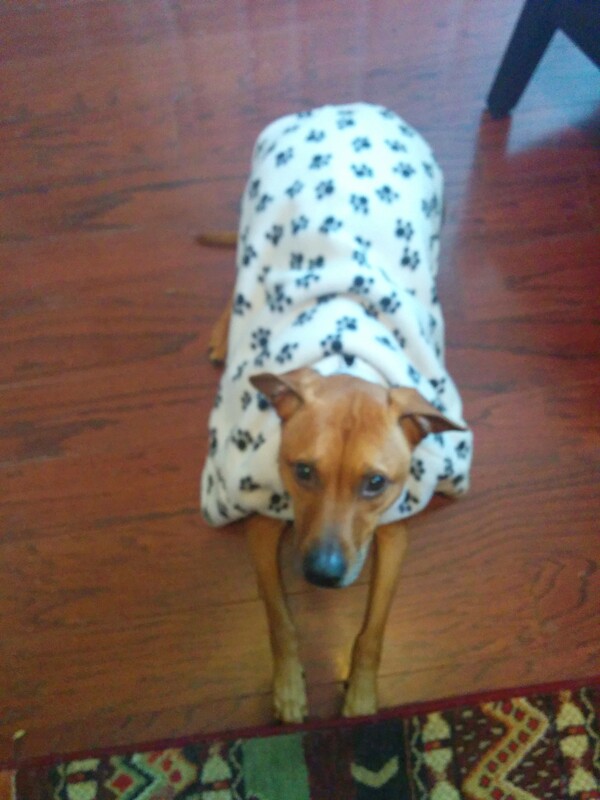 His tolerance for winter has declined significantly, so we’ve found ways to accommodate him. If you have an aging pup, there are a five things you can do to make the winter season more comfortable. 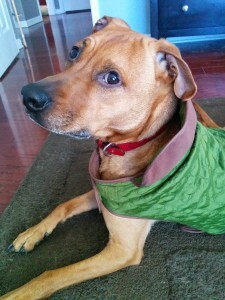 Buy or make a jacket for your pup. Emmett has two, the fleece shown above and a water-proof version, which can be layered. We don’t usually put his coat on for a backyard potty break (unless it’s sub-zero), but for walks, it’s crucial. 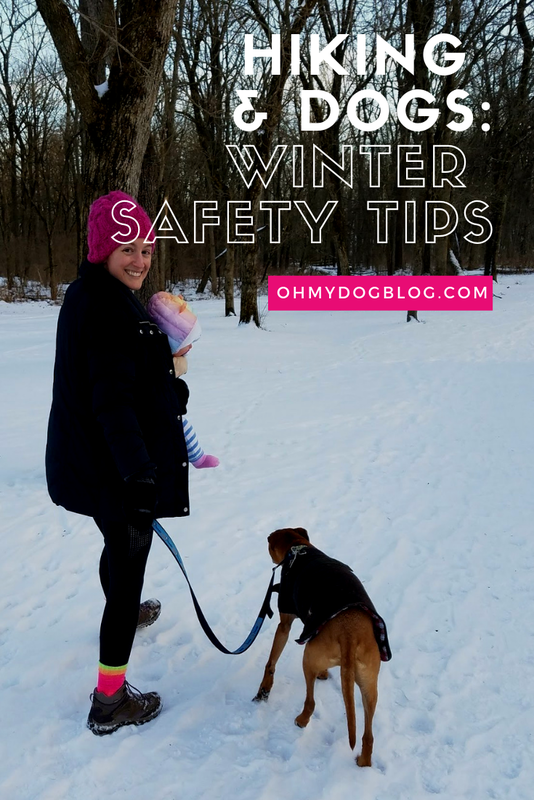 Salt and chemical de-icers are horrible for our dogs’ feet anyway, but for older dogs who might have a tougher time slipping and sliding on icy surfaces, boots are a must. They can be insulated or a simple rubber boot (like Pawz), but the goal is to provide your senior with some traction. 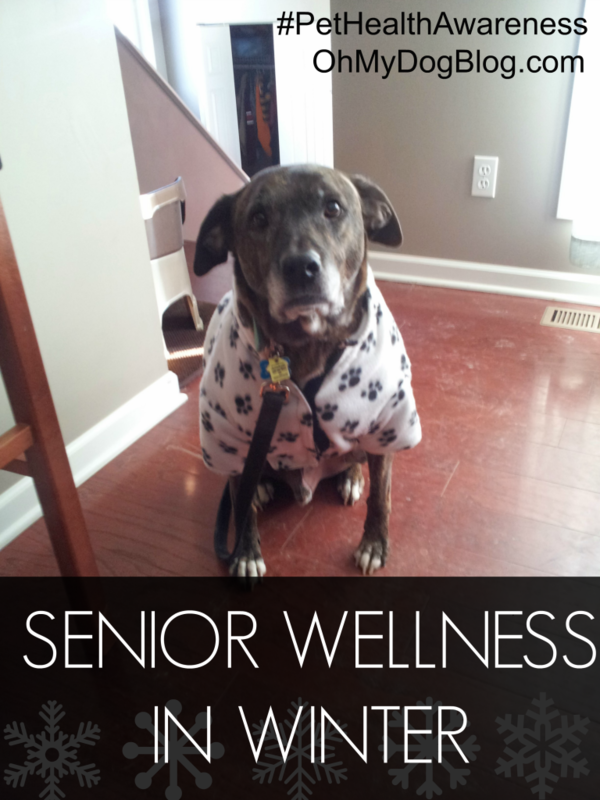 Take shorter walks and don’t leave your senior outside for any longer than he wants to be out. 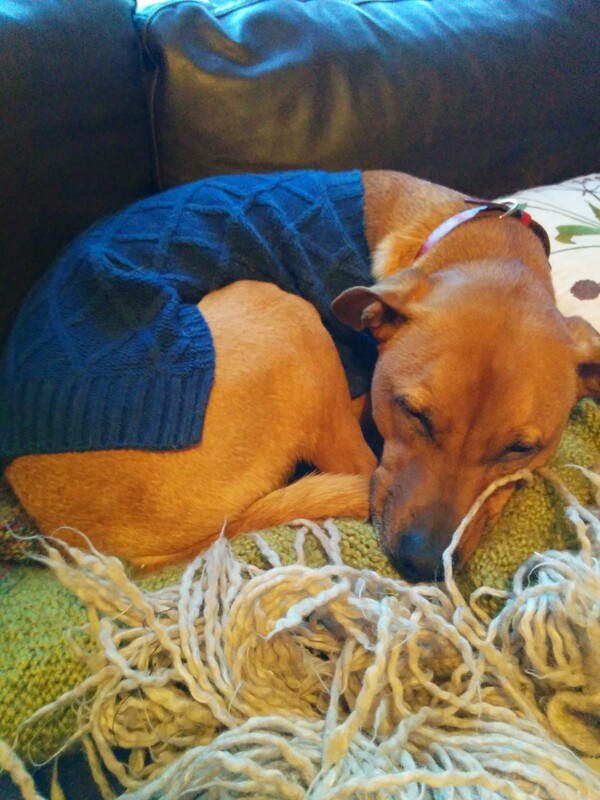 Provide plenty of warm spots: a dog bed by the fire, a heated blanket on the sofa, a pile of warm knits (bonus if they’re fresh from the dryer) on a pillow for nestling. Talk to your vet about adding supplements that can help alleviate wintertime joint stiffness or, if necessary, your vet can help you choose a medication to manage joint pain. 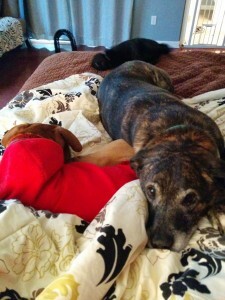 And, of course, for the benefit of both you and your senior pup, spend as much time snuggling this winter as possible! 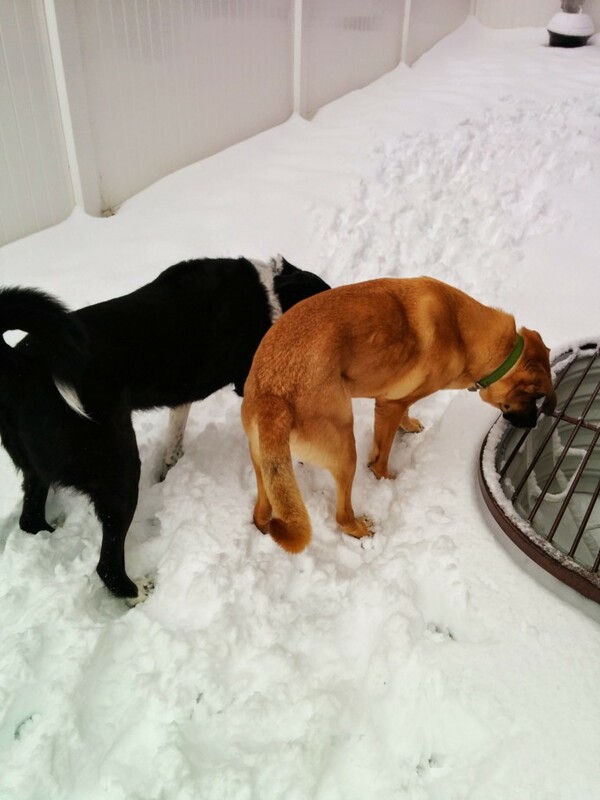 How does your dog do in the wintertime? Have you taken any steps – above or otherwise – to mitigate cold weather discomfort? Disclaimer: This post is sponsored by BlogPaws. I am being compensated to support Pet Health Awareness Month with an educational post, but OMD! only shares information we feel is relevant to our readers. BlogPaws is not responsible for the content of this article.